Congratulations to Nature Protocols authors James E. Rothman and Thomas C. Südhof, who alongside Randy W. Schekman have been awarded this year’s Nobel Prize in Physiology or Medicine “for their discoveries of machinery regulating vesicle traffic, a major transport system in our cells”, according to yesterday’s press release by The Nobel Assembly at Karolinska Institutet. This year’s award acknowledges the fundamental contribution that research by Randy W. Schekman, James E. Rothman and Thomas C. Südhof has provided to the elucidation of the system that precisely controls the vesicle-based transport and delivery of cellular cargo within cells and from the cells to the outside environment. This traffic control is essential for the correct functioning of cells, and defects to it are known to occur, for instance, in diabetes and in a number of neurological and immunological disorders. In detail, Schekman’s work has been instrumental in identifying the three classes of genes that control the cell’s transport system; Rothman, the author of two Nature Protocols articles, shed light on the mechanism by which the formation of specific protein complexes allows vesicles to dock and fuse with the correct target membranes; and, through his work of nerve cells, Südhof, the author of one Nature Protocols article, enabled the identification of the calcium ion–regulated molecular machinery that directs proteins to bind vesicles to the outer membrane of nerve cells, as a preliminary step to the release of neurotransmitters. Dr. Südhof’s contribution to Nature Protocols is not specific to the research just mentioned, but it does provide detailed instructions on how to perform high-throughput gene expression profiling in individual neuronal cells using quantitative PCR. The approach covered by this protocol enables the investigation of hundreds of transcripts from a single neuronal cell, and it can be used to characterize, for instance, lineage-specific, reprogrammed neuronal cells. One of the main areas of Dr. Rothman’s lab research is the protein superfamily known as SNAREs, which are present in yeast and mammalian cells. The key job of these proteins is to mediate fusion between vesicles and the cell membrane or the membrane of a cellular compartment. SNAREs are often subdivided into two categories, vesicle or v-SNAREs, which are embedded on the surface of vesicles, and target or t-SNARES, which are located on the surface of target membranes. 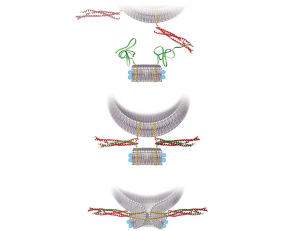 Interaction between v-SNAREs and their t-SNARE counterparts directs the fusion of vesicles to target compartments through the formation of a three-protein complex formed by cognate SNAREs anchored on ‘opposing’ membranes. The structure of a v-SNARE nanodisc. The green ribbons represent copies of a v-SNARE. Dr Rothman has co-authored two protocols published in our journal, both useful for the study of SNARE proteins. A 2012 paper describes the preparation of fluorescently labeled v-SNARE liposomes and t-SNARE–reconstituted planar, supported bilayers that can be used to monitor docking and fusion events by conventional far-field epifluorescence or total internal reflection fluorescence microscopy. One year later, almost to the day, we published a second protocol co-authored by Dr. Rothman. 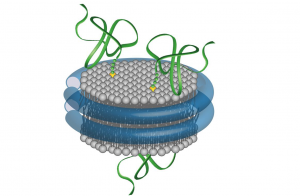 In this article the authors detail the preparation of nanodiscs of fixed (small) size that contain fluorescent lipids and copies of a v-SNARE. Upon fusion of one such nanodisc with a liposome containing the cognate t-SNAREs, the occurrence of a fusion event can be quantitatively monitored following the increase in fluorescence caused by the dispersal of the initially quenched fluorescent lipids from the nanodisc into the non-fluorescent, and much larger, interior of the liposome. Well, our heartfelt congratulations to Randy Schekman, James Rothman and Thomas Südhof for their achievement. And please forgive my lack of modesty when I point out that it also feels good to have it confirmed yet again that Nature Protocols authors are among the very best in their fields. CAUTION: Don’t mix concentrated nitric acid with organic solvents!